While nearly 1,000 Muslims gathered in Parliament Square for Jumah prayers on 22nd of March 2019, in solidarity with Muslim martyrs in Christchurch, New Zealand – and to demonstrate the responsibility of the Danish government and Western governments for nurturing hostile climate towards Islam and Muslims, once again a hateful act against Islam was carried out, 100 meters from the location where the prayer was held, where a number of people gathered on the other side of the square, tossed a copy of the Holy Quran between themselves and eventually burned it. All of this was done with the authorization and protection of the authorities. Some people immediately criticized Hizb ut Tahrir because of the activity it carried out in the Parliament Square, claiming that this activity was a provocation that caused this dirty work. They have overlooked the fact that there have been similar malicious acts of hatred in the past, of burning the Quran and trampling it in different parts of the country for a long time. And each time these violations occurred, they were carried out with the consent of the Government and under its protection. At the same time, the Imam Law was enacted, which is intended to prevent imams from declaring the values ​​of Islam and its laws if they contradict the laws and values ​​of the West. The first trial of this law is expected to take place on 26/03/2019. The Danish government has blessed the burning of the Quran under the title of freedom of expression, harnessing great potentials for the continuation of this. The hypocrisy of Danish politicians is limitless; in the name of freedom, the Quran is allowed to be burned, and in the name of freedom, Danish politicians put a bridle on the mouth of the imams, and in the name of freedom the Muslim niqab is banned and in the name of freedom, successive Danish governments participate in the wars in the Muslim countries. 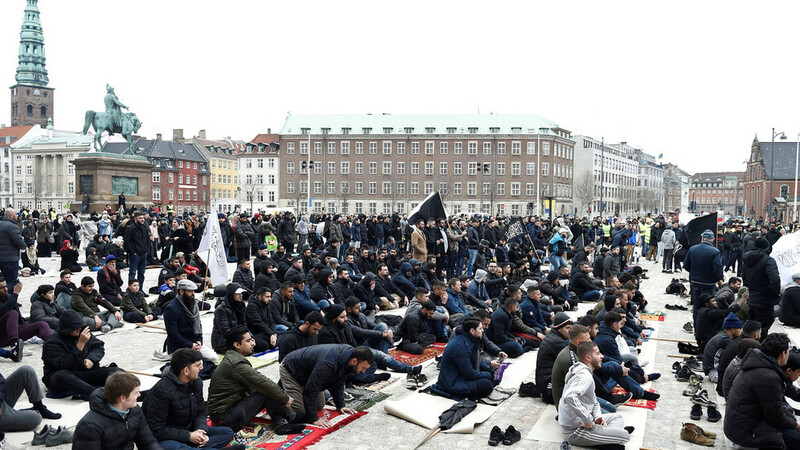 In the name of this lie and the false name, freedom, Danish politicians take their anti-Islamic stance and seek to create suspicion, hatred and malice against Muslims. This climate of hatred and malice is not merely a word or a speech, although this feeds it, but on the contrary, it is used to legitimize the policy of dissolving Muslims in society and to participate in wars in Muslim countries, which have claimed a large number of lives and caused the suffering of people. It is this climate that dominates the entire Western world, the horrific massacre in the two mosques in New Zealand, and the burning of the Quran in many parts of Denmark are but the rotten outcome of policies that politicians in Denmark and the West have generally practiced for two decades. It is expected that in this period leading up to the upcoming parliamentary elections, the various parties will declare a stand in the face of right-wing extremism, hoping to win the votes of Muslims. But instead of Muslims giving their votes to them, they must hold these politicians accountable for the hatred and hostility which these politicians created, and for the rift that they have created in society. The extreme right-wing threat is not an imaginary monster that came from the void, but on the contrary it is a natural result of the currents that dominate the political circles in Denmark and the West in general, which were contributed by the red and blue governments alike.